I am currently involved in a bible study surrounding a book written by John Piper. 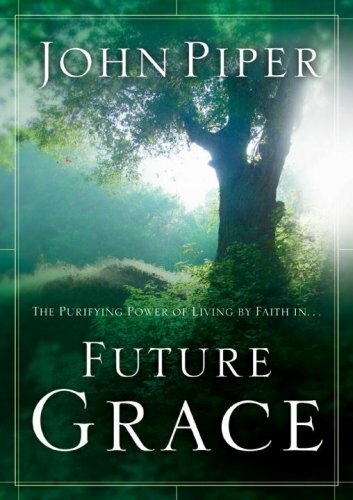 The book is titled Future Grace. We’ve been doing the study for about 4 weeks now and it is great. The first thing Piper educates us on is this thing called future grace. Piper contrasts future grace with gratitude. He challenges us to find anywhere in the bible where believers were motivated to obedience out of gratitude. He contends that this good deed behavior out of gratitude is called debtor’s ethic. It says that since you have done something good for me I am indebted to do something good for you. This is contrary to what God intended. God intended for true gratitude to be a spontaneous expression of pleasure in the gift and the good will of another. There is a good quote in the very first chapter that kind of describes it with clarity for me. With true gratitude there is such a delight in the worth of God’s past grace, that we are driven on to experience more and more of it in the future. But this is not done by payments of debt in any ordinary sense. Rather, it is done by transforming gratitude into faith as it turns from contemplating the pleasures of past grace and starts contemplating the promises of the future. This future grace is grace provided by God in the next day, in the next hour, in the next minute. We have confidence from past grace to trust God for His future grace. It is an awesome thing to behold and trust in. In our study we recently discussed chapter six. It contains one of the most convicting things I’ve ever encountered. Faith in future grace versus pride. The chapter discusses three competitors to God for the human heart. Wisdom, might and riches. We think these can be obtained by our own self reliance. It is radically humbling to confess that the source of all our joy resides outside of ourselves. 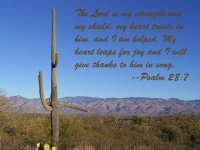 Pride is such an obstacle to future grace it opposes the hope and trust in the promises of God because we trust in ourselves, or others, or material things. But when we trust in God and His future grace we put away this human pride and walk in the second, the minute, the hour, and the day of God’s future grace. As we continue in this study I will post some more information about it and review it as a whole. More to come. I guess it is time to make another post to my blog. Much has happened since the last post and really the the biggest news is recent news. Glory is to the Lord, this week I was laid off from my job of six years. The news was a bit of a shock but work has been winding down as of late and the system I am very familiar with is being replaced by another system. Basically for the past several months all of us at this company have been working ourselves out of a job. My company (actually God) has provided us with a great severance package that will provide for us until the middle of July. Please be in prayer for my family as we process through this and for godly wisdom as I seek better employment. I have a few folks looking for work for me and I trust that God will provide. Everything in life is according to His timing.